To make the most of your visit to Aix with your loved ones, family or friends, the new tourist pass is available from the Tourist Office. Child rate: from 3 to 13 years old. Adult rate: from 14 years old up. 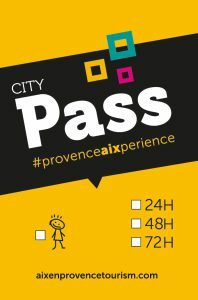 CityPass #provenceaixperience is a product for FIT use only. It is not to be used for group bookings. On site withdrawal the day of the tour, on presentation of a voucher or sent to the address and at the expense of the payer. Please contact us to set up your personalised retailer agreement. Purchase orders need to be sent by writing to Office de Tourisme Aix-en-Provence. CityPass users need to pick up their passes at Office de Tourisme Aix-en-Provence (see address above and link to opening hours). The City Passes are not sent by mail. Travel industry vouchers are accepted and need to be agreed in advance by Office de Tourisme Aix-en-Provence. Upon booking, an invoice is issued by Office de Tourisme Aix-en-Provence and sent to the retailer. Payments need to be done by wire transfer (bank details mentioned on the invoice). Bank charges for wire transfers need to be paid by the retailer. The City Passes are held at the retailer’s disposal once the full payment has been received on the account of Office de Tourisme Aix-en-Provence. Once being purchased, the City Passes are not refundable and cannot be exchanged. A CityPass is valid for the chosen duration (24, 48 or 72 hours). and ends 24, 48 or 72 hours later (according to the chosen type of CityPass). The CityPass needs to be presented at the entrance control of each included visit or activity in order to be verified and recorded. The CityPass is valid for one single use of each included service. Opening hours and days vary from one provider to another. Some providers do not operate all year round. Please refer to each provider’s website for more information. Office de Tourisme Aix en Provence cannot be held responsible if a provider service is not available (due to strikes, exceptional closings or other events).